We planned a tough day, and it was. Leaving Horseshoe Meadows before 6am to try and beat the afternoon storms, we did the 4.2 mile climb to Cottonwood Pass. (11,160ft) Once back on the PCT we turned north and did another 11 miles to a nice campsite next to Rock Creek. Amazingly, the storms missed me. Robin and Carla who left camp 2 hours later were hammered for about 30 mins with a fierce thunderstorm at the top of Cottonwood Pass. Overall, it was a long and exhausting day for all. Today was somewhat sad: our party split and we said goodbyes to Mother Goose, Robin and Carla. They weren’t going to summit Whitney, so they headed north while we headed east. It was nine miles to Guitar Lake, the last water before Whitney. We arrived just after 1pm and set up camp. The clouds looked heavy and I barely had time to boil some water before the first storm hit. What a show! 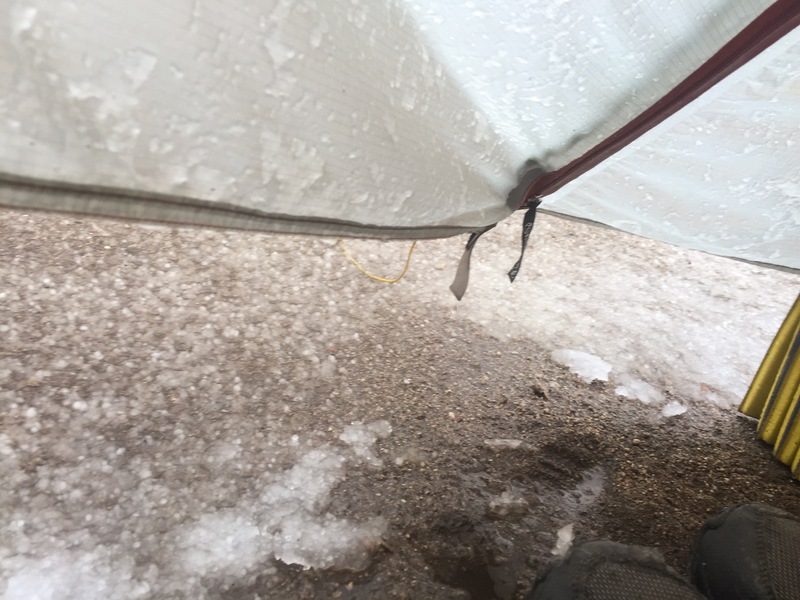 It dumped enough hail to coat the ground white and the weight collapsed Bill’s tarp. Then the rain came and washed the hail away. Then it repeated! It rained or hailed for four solid hours then gave us a 30 min break. Now a light rain is falling. 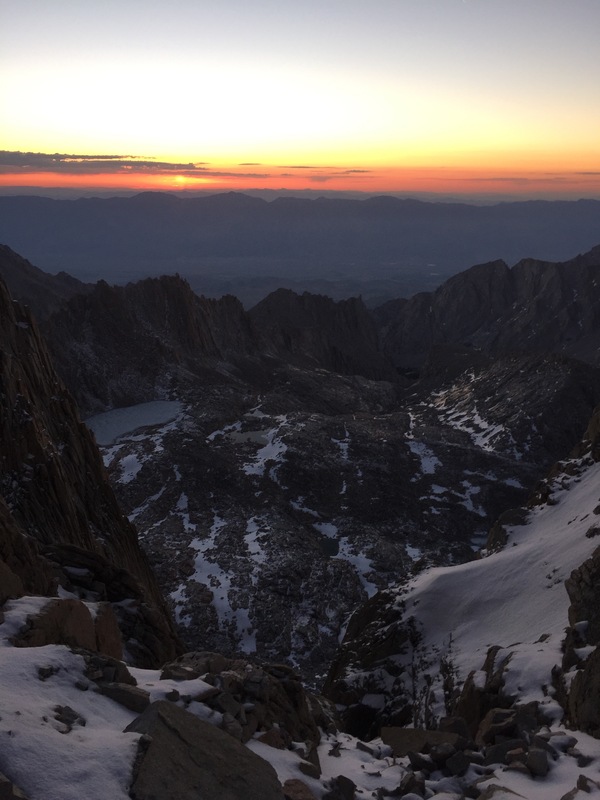 Our plan is to leave at 1am to be on top of Whitney for Sunrise, weather permitting! It will be a cold, dark, 5 mile climb from the lake at 11,400ft to 14,505ft. There is no moon tonight, but if the sky is clear we may have some starlight. I have extra batteries for the headlamp, and I’ll need them. I’m taking all the warm clothes I have and my stove to make some hot chocolate at the top. The ascent is made more dangerous due to ice. We know that there is a 0.8 mile section from Trail Crest to the peak along the final ridge at 14,000ft with ice, and the storm today may have added to that. If we chose to start at daybreak, chances are the ice would be slushy by the time we got there. But at 4am it will be quite hard. The Professor and I have micro-spikes, but the others do not. It will be a slow crawl on the last mile. It’s just the five of us for the climb: Nikki (Fire Ant), Bill (Marilyn), Skip (Professor), Pat (Turtle) and myself. 12:30am and we gathered around. No one got much sleep, so we’re all bleary eyed. Bill announced he will not summit Whitney. We left just after 1am. There were no clouds and no moon, so you could see the Milky Way across the sky. It was very dark and our world was defined by what the headlamp illuminated. Anything off trail was in a dark abyss. Nikki was leading the three old men and the climb was steady. 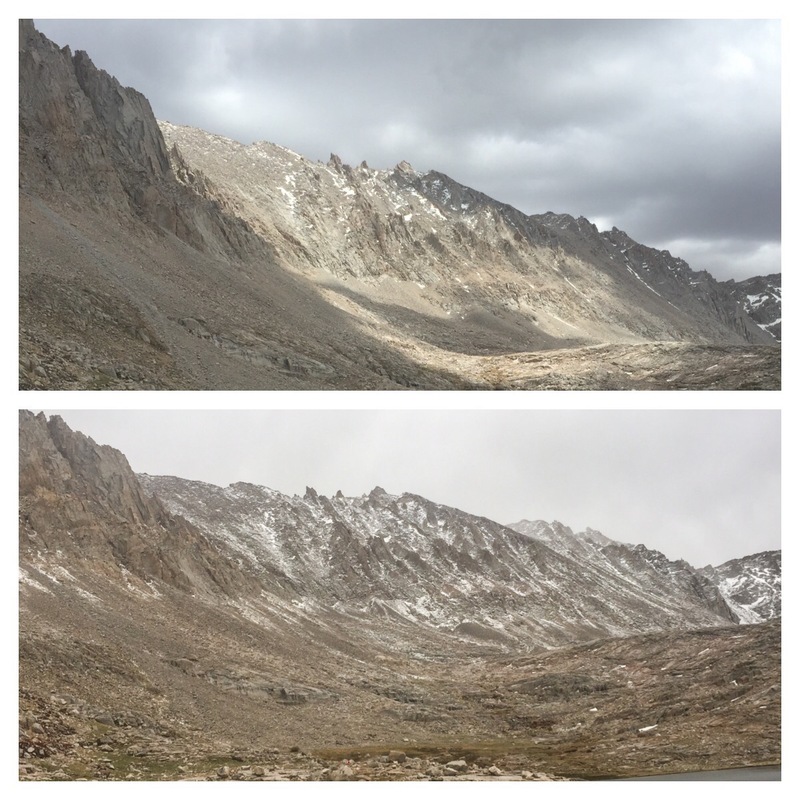 There was lots of ice left over from the storms which turned to snow above 12,000 ft. It dumped over a foot at the peak. 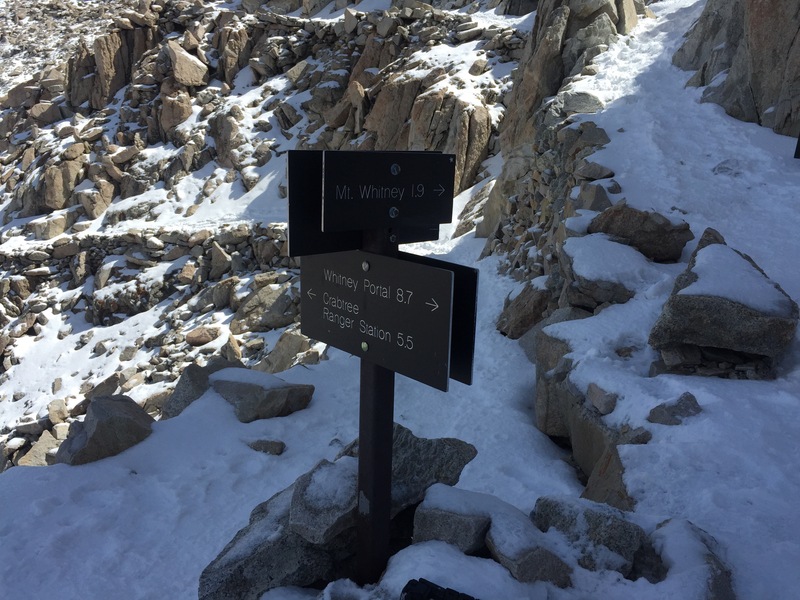 I put on my micro-spikes at Trail Crest (13,500ft) and led for the dangerous part. That’s where Nikki developed Altitude Sickness. She made it to 13,900ft and had to turn back. She felt disoriented and the cold air (mid-upper 20’s) hurt her lungs. Three tired, old men slowly made it to the top. It took six hours and was after 7am when we arrived, so the whole sunrise bit was moot. 😓 But WE MADE IT!!!! It took about 2 hours to descend due to the snow, but we all made it safely down. Nikki and Bill wanted to hike another 8-12 miles that afternoon, but we three were too exhausted from the climb and lack of sleep. They took off and we did descend 3 miles and 1,000ft back to tree-line before eating an early dinner and crashing. Overall, it was worth the pain. 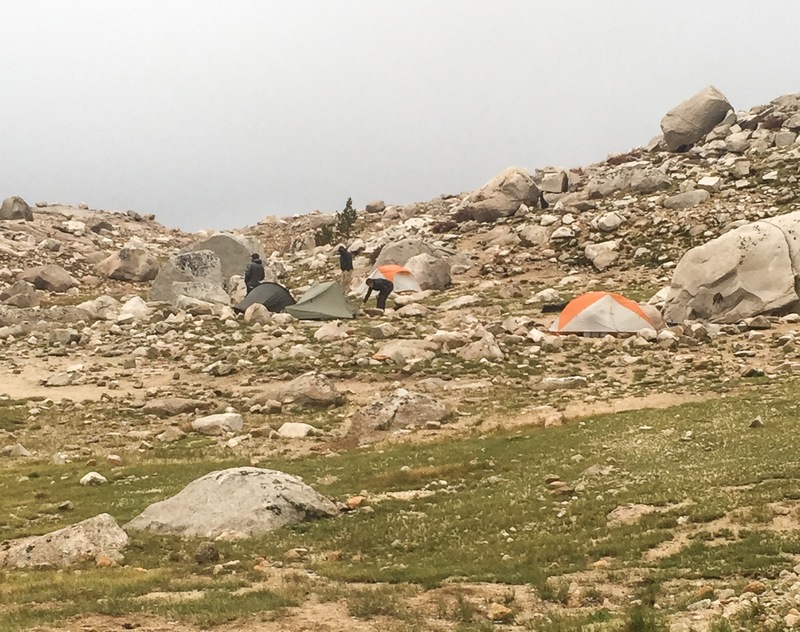 Our camp at Guitar Lake, 11,500ft just before the storms hit. The approach up before and after the storms. Whitney is hidden to my left. Sunrise from 14,000ft, before the summit. 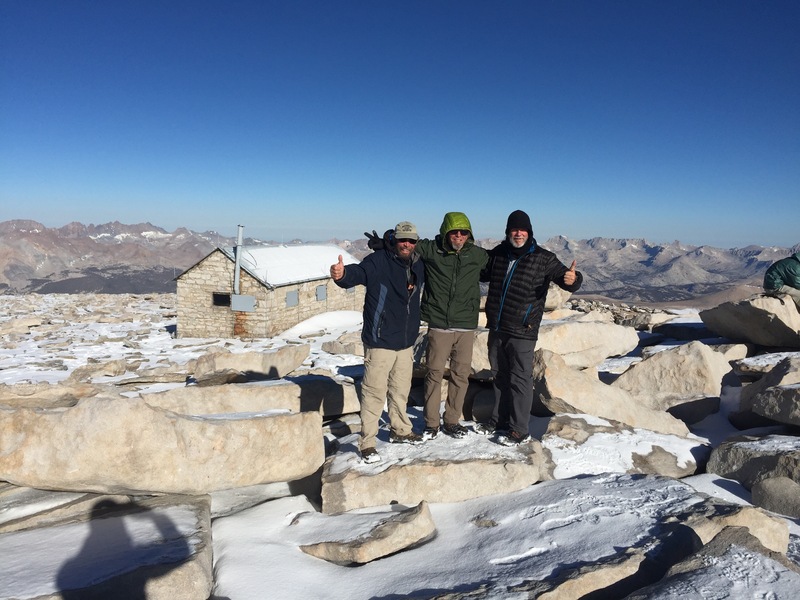 Three old men who made it to the top!!! So incredibly AWESOME! You guys look terrific at the top of the mountain! Awesome! Great photos. Thank you for sharing.